UPDATED: Thu., Sept. 14, 2017, 8:19 p.m. The gun used by a Freeman High School student to kill a classmate and wound three others were taken from his father’s gun safe, according to court documents. Sharpe is accused of shooting and killing student Sam Strahan at Freeman High School. He then walked down the second floor hallway, shooting randomly at others. Three girls were wounded, including Emma Nees, Gracie Jensen and Jordyn Goldsmith. 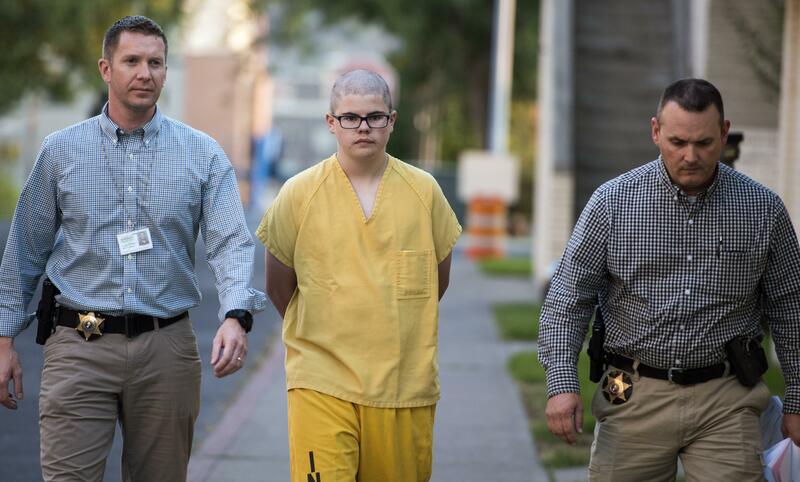 Spokane County Sheriff Ozzie Knezovich said at a press conference Thursday that Sharpe will likely be tried as an adult for premeditated first-degree murder. The families of the three wounded students released a statement Thursday expressing their gratitude to the community and asking for privacy. Emma Nees, Jordyn Goldsmith and Gracie Jensen are all in satisfactory condition at Providence Sacred Heart Hospital, which released the statement on behalf of the three families. “We wish to express our overwhelming gratitude for the outpouring of support and love you have shown our families in our time of need,” the statement reads. “Everyone – our friends, Freeman School District, first responders, the trauma team and care providers at Providence Sacred Heart Medical Center and Children’s Hospital, the communities of Freeman as well as Spokane – have all been phenomenal. No words can express our gratitude. “In this, our darkest hour, we feel blessed and lucky in so many ways. Our daughters are recovering from their wounds, and we know that your thoughts and prayers are with us. The Sharpe family also released a statement through their attorney, Bevan Maxey. “The Sharpe family wishes to offer their deepest condolences to the entire Freeman community, especially the families of Sam Straham, Emma Nees, Jordyn Goldsmith and Gracie Jensen,” the statement reads. In the court documents, investigators interviewed Sharpe, along with dozens of students and school staff, and wrote a description of how the events unfolded. Sharpe’s morning started, as it usually did, on a school bus. However, that morning he brought a duffel bag on to the bus, according to his bus driver. She found this suspicious because she knew Sharpe didn’t play any sports, she told police. Inside that bag were two weapons: a semi-automatic rifle and a handgun alongside numerous boxes of .223 rifle ammunition. After arriving at school Sharpe headed straight to the second-floor hallway. Just after 10 a.m. he dropped the duffel bag and removed the rifle. He started to load the gun; however, it jammed. As Sharpe struggled to load the weapon, fellow classmate Sam Strahan approached. Sharpe then pulled the pistol from under his coat and fired a single shot, striking Strahan in the stomach. Strahan collapsed forward, at which point Sharpe shot him again, this time in the face. Sharpe continued to walk and shoot down the hallway. He told investigators he believed he shot three more students, but didn’t intentionally target any of them. Video surveillance showed that after firing into a large crowd, Sharpe then threw the handgun down. He was then confronted by the high school janitor. According to a nearby teacher, Sharpe raised his hands above his head in surrender as the janitor approached. Sharpe bragged of owning multiple guns and knew how to make improvised explosive devices, according to one of Sharpe’s classmates. Sharpe also told his classmate that his father buys him guns, according to court documents. Sharpe’s father told police that Sharpe knows the combination to his gun safe. According to Sharpe’s mother, he had written a suicide note a week prior. Sharpe’s school counselor knew he was suicidal, according to court documents. Freeman student Christina Morrison said she knew Sharpe well. He was suicidal, had “mental problems” she said. She never expected him to be violent, however. Published: Sept. 14, 2017, 11:03 a.m. Updated: Sept. 14, 2017, 8:19 p.m.